Tags: Bright Red, Daily Wear, Semi Formal, Shalwar, Shirt. 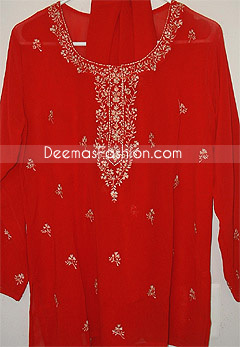 Top: Simple red Georgette long shirt which is fully embellished with small ornamental motifs all over the front. Exquisite embellishments work done on neckline. Embellishment work include, tila, thread gotta etc. Dupatta: Simple plain red chiffon dupatta.